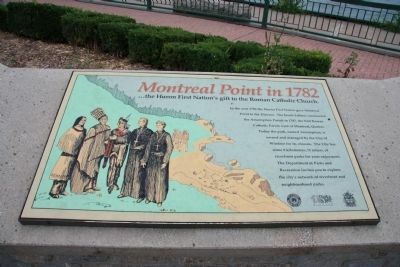 In the year 1782 the Huron First Nation gave Montreal Point to the Diocese. The Jesuit Fathers constructed the Assumption Parish in 1787, the first Roman Catholic Parish west of Montreal, Quebec. Today the park, named Assumption, is owned and managed by the City of Windsor for its citizens. The City has some 8 kilometers, (5 miles), of riverfront parks for your enjoyment. The Department of Parks and Recreation invites you to explore the city's network of riverfront and neighborhood parks. Erected by City of Windsor, Parks & Recreation. Location. 42° 18.704′ N, 83° 4.066′ W. Marker is in Windsor, Ontario, in Essex County. Marker is on Riverside Drive West north of Askin Avenue, on the right when traveling west. Touch for map. This historical marker is located in a community riverside park, on the south side of the Detroit River, in a residential district. Marker is in this post office area: Windsor, Ontario N9B, Canada. Touch for directions. 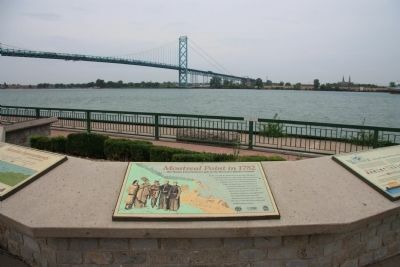 View of the historical marker in its location overlooking the Detroit River, with a view of the Ambassador Bridge in the background. kilometers away); Ste. Anne Church (approx. 1.3 kilometers away in the U.S.); Gabriel Richard (approx. 1.3 kilometers away in the U.S.); Fort Street Presbyterian Church (approx. 2.1 kilometers away in the U.S.); The Detroit Free Press (approx. 2.2 kilometers away in the U.S.); The Battle of Windsor - 1838 (approx. 2.2 kilometers away); Detroit Free Press (approx. 2.2 kilometers away in the U.S.). Touch for a list and map of all markers in Windsor. More. Search the internet for Montreal Point in 1782. Credits. This page was last revised on June 16, 2016. This page originally submitted on October 30, 2010, by Dale K. Benington of Toledo, Ohio. This page has been viewed 786 times since then and 3 times this year. Photos: 1, 2. submitted on October 30, 2010, by Dale K. Benington of Toledo, Ohio.